A brutal attack by PNG Defence Force officers from the Goldie Barracks has left a security personal with injuries. The lone guard from the Pacific Corporate Security firm was assaulted at the security base after security officers arrested a suspect involved in an arm robbery at the Penthouse club over the weekend. The arrest of the armed robbery suspect took place outside the perimeters of the barracks and had no relation to the Defence Force officers. The victim Ben Mote from Chimbu was severely bashed by two loads of truck with uniformed officers. “They hit me from the back of my head and my mind went off…they bit me up and dragged me on the ground,” Mote said. Mote was rescued by a police dog unit who intervened to stop the attack and rushed him to the Port Moresby General Hospital. “My boss has called the Minister for Defence and he is aware of what had happened so we’re just waiting for their (Defence Force Hierarchy) response,” he said. In a phone interview, Pacific Corporate Security Managing Director Jacob Kaupa said he was concerned with the approach taken by the soldiers. 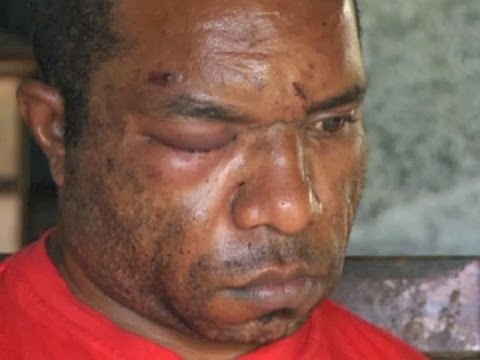 Kaupa said an internal investigation will be carried out by the firm and called on the PNG Defence Force hierarchy to apprehend the officers involved. This attack has raised concern from the public after similar attacks and burning of properties outside 7-mile and the rampage done at the Medical Faculty. The public are alarmed by the discipline of the force.